Stretch and Pray DVD -- A companion to Murray D. Finck's popular Stretch and Pray book, this helpful DVD features Pastor Finck guiding you through forty gentle stretches, movements, and postures to improve physical and spiritual well-being. 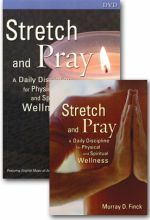 Stretch and Pray Book -- In this book, Finck provides a step-by-step guide to forty stretches to improve physical and spiritual well-being. Individuals can select the postures that work for them and customize a daily routine.